Carrying your baby sling is not only incredibly practical and useful for integrating a baby into your daily life, but it is also the best way of offering you access to the richest and most beneficial environments possible for you and your child. What happens when it is cold? Without a doubt the best option is to shelter a baby in a sling using a coat from Momawo. Why wear a coat instead of simply putting more clothes on your baby? If the baby is wearing warm clothes it will be very tight in its sling, which normally causes a parent to loosen the sling in order to provide the baby with more space. However, this tends to disrupt the sling´s optimal gravity and the optimal weight conditions to avoid back pain. The baby carrier and the body of the parent already offer warmth to the baby. If we place another coat between the parent and the baby we risk not knowing the exact temperature of our baby. Dressing both the parent and baby in the same coat allows the parent to be close to their child and to be aware of the exact temperature. We want to emphasize that the coat will be sufficient for keeping the baby warm and comfortable. Your ideal babywearing coat will match the temperatures where you live. Our catalogue of coats and jackets covers a wide range of possibilities from the Momawo 4 in 1 Coat and the Fleece Mom&Dad, for cooler days and weather, to the Momawo LightCoat for softer, gentler times. The coats are comfortable and easy to use. They come in modern, elegant designs. Thanks to an insert attached to the coat by a simple zipper and adjustable elastic straps, the coat easily accommodates pregnancy. The baby can then be carried in the front or on the back and, when ready, the coat can be returned to its function as a fashionable coat for everyday use. These are only some of the main reasons for why sheltering a baby has become practical, comfortable, and healthy for the whole family. If you try a Momawo Coat we encourage you to share your experience with us. We guarantee it will be positive. 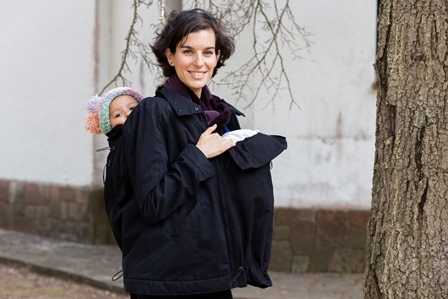 Thanks to Momawo’s coats you can continue to enjoy the benefits of babywearing even when it’s cold! · Regulate their temperature better; respiratory, digestive rhythm, etc. · Are healthier! Since they don't spend so much energy in other tasks (crying, regulating their temperature, etc. ), therefore gaining weight faster. · Motor stimulation. They have better motor skills, coordination, increase in muscle tone and sense of balance. · Tactile stimulation. They feel skin contact, they are wrapped and cuddled, besides they are caressed often. They keep a position similar to the one inside the mother’s womb. · Correct position. In an ergonomic babycarrier the position is adequate and favourable for the correct development of the baby’s spine, femur and hips. · Visual stimulation. Get a better view of the world. · Safety. They get independent faster! Making them more confident and detached. · Sleep better. They sleep faster and longer. · They can be nursed everywhere! · Learn more! They are not over-stimulated, but still calmed and alert; they keep observing and gaining awareness of the world surrounding them. · Wellbeing. The baby feels the safety of what he is familiar with (warmth, smell, parent’s voice).This reduces their stress and improves wellbeing. · Social integration. The baby takes part of parent’s life (present in talks with friends, everyday life activities). · They are happier! They feel loved and safe.